Precision coating thickness gauge based on the ultrasonic pulse run-time method. The QuintSonic 7 enables measurement of up to 5 coatings in a single operation. It is possible also to measure polymer coatings like paints, varnishes and synthetic materials as well as glass, ceramic or metallic coatings on virtually any substrate. Varnish on synthetic materials, copper on ceramic, synthetic materials on wood, or glass on metal form the typical coating systems that can be measured by the QuintSonic 7. As the first equipment of its sort, the QuintSonic 7 makes it possible to measure coatings on fibre-reinforced plastics, e.g. GFRP, CFRP, WPC. 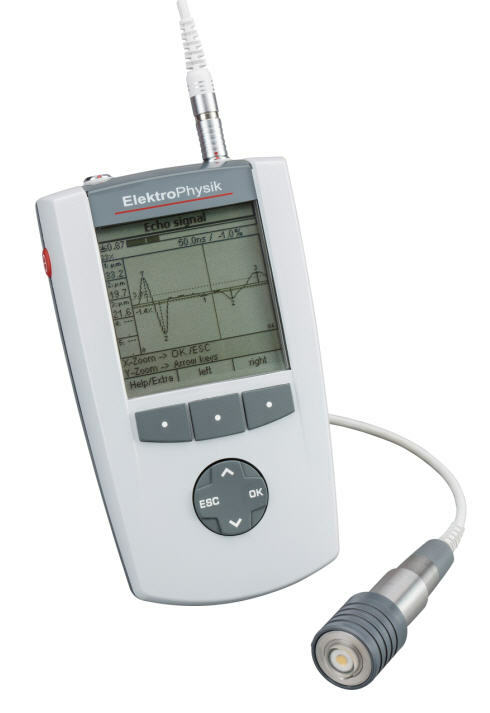 The intelligent evaluation of the ultrasonic signal reading allows rapid recording of measured values of over 40 measurements per minute. Simple calibration and graphic display of the test results on the A screen of QuintSonic 7 enables quick operability and versatile use. A challenge in ultrasonic coating thickness measurement are layers exhibiting very similar material properties. Their impedance values do not vary significantly enough in order to provide clear echo signals. The innovative clipping function of QuintSonic 7 offers a solution to this problem so that also very weak echoes can be clearly distinguished. Thus even very difficult settings of task of this kind can be solved with utmost reliability and precision. Up to 5 coatings in a single operation. Also suited for wall thickness measurement. QuintSonic 7 can also be used for measuring thin substrates through the coating. QuintSonic 7 offers a wide range of applications in the automotive industry, aircraft manufacturing or any other industrial branch where accuracy is of high importance. Over 40 measuring values per minute: start, wait for 1 second, done. Particularly innovative is the A-scan image function that is available on the graphic display without the need to connect the gauge to a PC. This enables utmost reliability of measurement in any situation and makes QuintSonic 7 the ideal gauge for on-site use, use in the laboratory or use on the shop floor. Additional comfort is added by the possibility to determine the sound velocity by means of reference samples. Once the sound velocity of a given material has been determined, it can be stored in the data base to be available for further measurements. 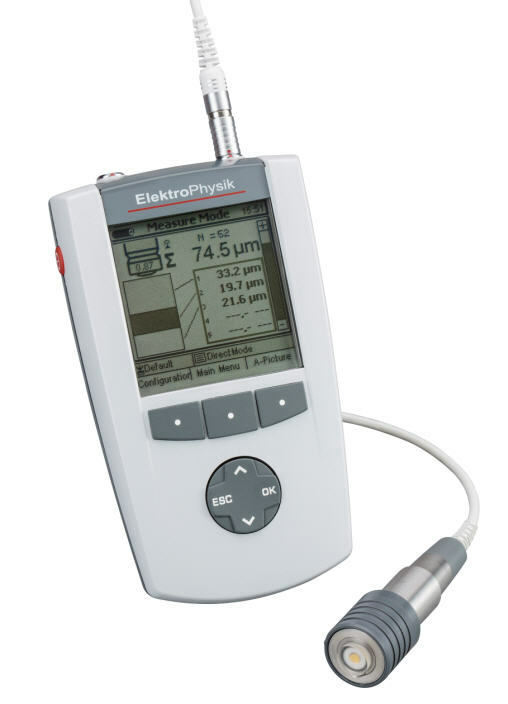 Up to five polymer layers can be detected and measured in a single operation using the new portable QuintSonic 7 made by ElektroPhysik. The thickness of paint, lacquer and plastic coatings applied on metals, plastics, wood, glass and ceramics substrates is measured with high precision and shown on a large display. QuintSonic 7 is the first ultrasonic gauge which allows coating thickness measurement on GRP and CRP components. The new QuintSonic 7 is the first gauge of its kind to measure coating thickness on light construction components made of GRP precisely. Up to five polymer coatings on a variety of substrates such as metal, plastics, wood, glass or ceramics are detected at the same time. Its specials skills qualify the handy gauge for sophisticated applications in the automotive industry as well as in aircraft construction. As an additional feature, the gauge also offers to measure thin substrates through a coating. The working principle of the QuintSonic 7 which is composed by a basic unit and a fixed sensor is based on the reflection of ultrasonic waves at the boundaries between the single layers. 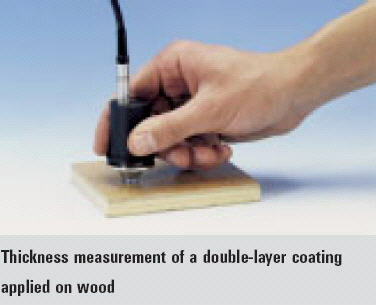 The intelligent ultrasonic coating thickness sensor combines both functions of sender and receiver for this operation. The transducer introduces the ultrasonic pulse in the layer system through a couplant. When the ultrasound beam crosses a boundary between two layers or to the substrate (base material), part of the signal is reflected. These reflections are picked up by the sensor and evaluated in a sophisticated mathematical process. This process analyzes the runtime of the ultrasound pulses and converts it into coating thickness with a resolution of 0.1 µm. Being handy (150 mm x 82 mm x 35 mm) and light-weight (150 g), the gauge nonetheless brings along user comfort, high performance and a practically oriented design. The intuitive menu control, large backlit control keys and the backlit graphics display fulfil all requirements on ergonomics. The direct illustration of A-scans on the display without the need to transfer the readings to a PC can be considered as particularly innovative. The QuintSonic 7 gauge is hence highly qualified for portable use in the field.Convenient data management offering individual naming and creation of directory structures based on file management as known through common PCs supplements the gauges functional range. All parameters required for measurement can easily be set using the PC software QSoft 7 Basic Edition which is part of the delivery scope. A-scans can hence be illustrated on the PC screen in colour and large size. The QSoft professional edition allows to create batches via PC, to evaluate readings transferred to PC and to export to various data formats. Readings can not only be exported to text and excel format but also shown as complete measurement records in pdf format. Additional text as well as photos of the measuring object can of course also be embedded in these reports. .
QuintSonic 7 can be connected to external peripherals via numerous interfaces such as the portable data printer MiniPrint 7000 also offered by ElektroPhysik or an infrared interface. (IrDA 1.0). A wide range of options allows upgrading the gauge by alarm, audible or switching functions.